FRoM 500 BIllIoN KWh cilities, sail and operate project vessels, and invest in ofshore energy ventures. Capuano. 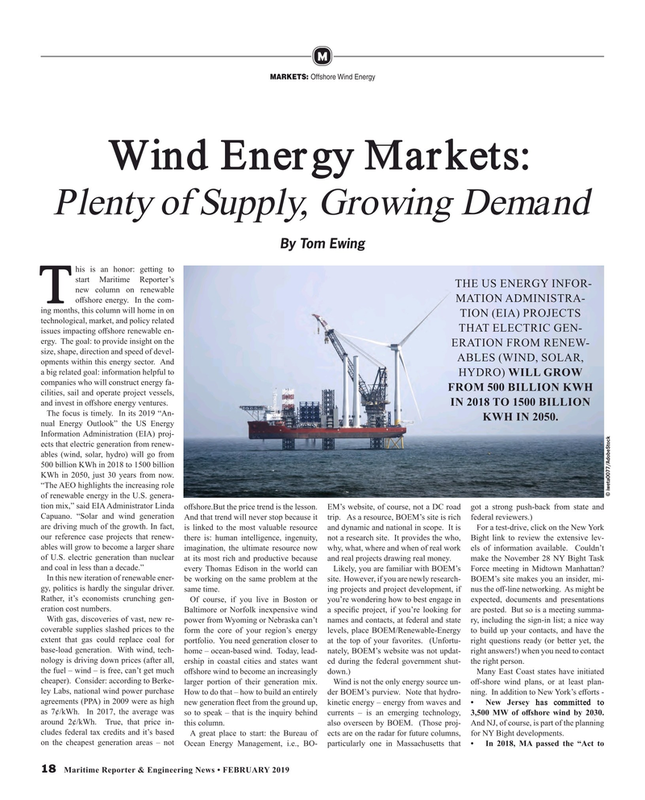 “Solar and wind generation And that trend will never stop because it trip. As a resource, BOEM’s site is rich federal reviewers.) are driving much of the growth. In fact, is linked to the most valuable resource and dynamic and national in scope. It is For a test-drive, click on the New York our reference case projects that renew- there is: human intelligence, ingenuity, not a research site. It provides the who, Bight link to review the extensive lev- ables will grow to become a larger share imagination, the ultimate resource now why, what, where and when of real work els of information available. Couldn’t of U.S. electric generation than nuclear at its most rich and productive because and real projects drawing real money. make the November 28 NY Bight Task and coal in less than a decade.” every Thomas Edison in the world can Likely, you are familiar with BOEM’s Force meeting in Midtown Manhattan? Of course, if you live in Boston or you’re wondering how to best engage in expected, documents and presentations eration cost numbers. With gas, discoveries of vast, new re- power from Wyoming or Nebraska can’t names and contacts, at federal and state ry, including the sign-in list; a nice way coverable supplies slashed prices to the form the core of your region’s energy levels, place BOEM/Renewable-Energy to build up your contacts, and have the extent that gas could replace coal for portfolio. You need generation closer to at the top of your favorites. (Unfortu- right questions ready (or better yet, the base-load generation. With wind, tech- home – ocean-based wind. Today, lead- nately, BOEM’s website was not updat- right answers!) when you need to contact nology is driving down prices (after all, ership in coastal cities and states want ed during the federal government shut- the right person. A great place to start: the Bureau of ects are on the radar for future columns, for NY Bight developments.